The first blank hat brand we’ll delve into is OTTO Cap! OTTO International, Inc. is one of the leading worldwide manufacturers and suppliers of quality headwear. 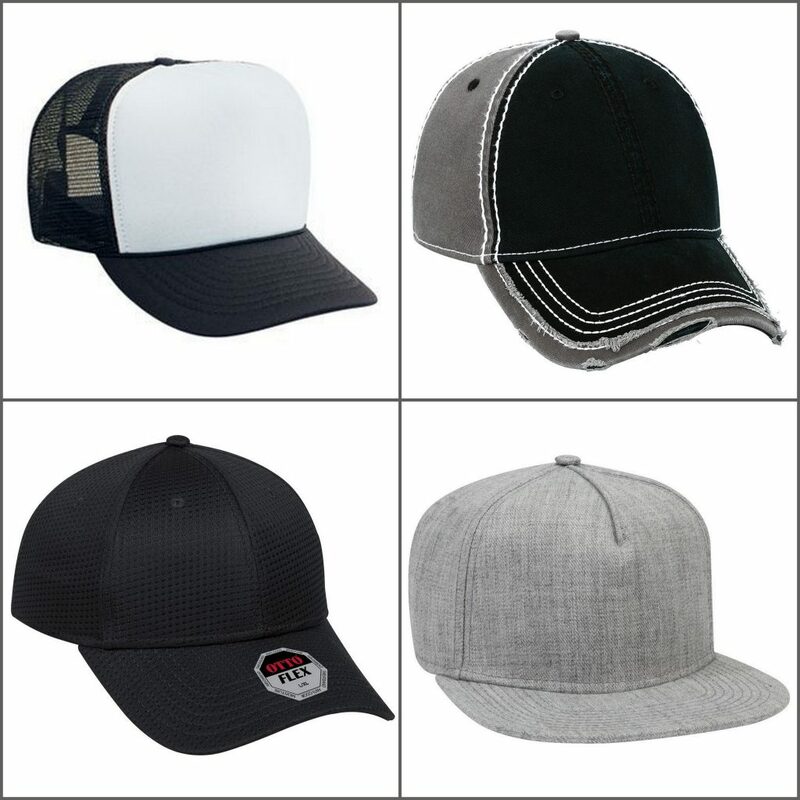 OTTO Cap’s mission is to provide the best promotional blank hats for embroidery, imprinting at affordable prices. OTTO Cap Polyester Foam Front Five Panel High Crown Mesh Back Trucker Cap — One of our best-selling trucker caps! Made with 100% Polyester front and 100% Nylon mesh back, this OTTO trucker cap is sure to keep you dry and cool all day long. Available in 18 colors, these custom trucker hats are perfect for screen printing as they provide a big front canvas for your design or logo. OTTO Cap Garment Washed Cotton Twill w/ Heavy Stitching Distressed Trim Edge Visor Six Panel Low Profile Dad Hat — Distressed caps are making a comeback and OTTO Cap is all for it! Made with 100% Cotton, this garment washed dad hat is the perfect blend of softness, comfort, and breathability. These blank distressed hats from OTTO Cap are available in 13 colors. OTTO Cap Cool Comfort Stretchable Polyester Mini Waffle Mesh “OTTO FLEX” Six Panel Low Profile Baseball Cap — Made with 100% Polyester, and features a flexible fit, this OTTO Flex is going to keep you cool and comfortable at any occasion. It’s available in S/M & L/XL two sizes. OTTO Cap Heather Wool Blend Twill Square Flat Visor “OTTO SNAP” Five Panel Pro Style Snapback Hat — This OTTO Snapback is made with 85% Acrylic and 15% Wool that’s smooth, warm and you can wear it all the year round. Available in 7 colors, these OTTO custom blank snapback hats are perfect for logo embroidery. Flexfit is one of the world’s largest vendors of custom, private label headwear. 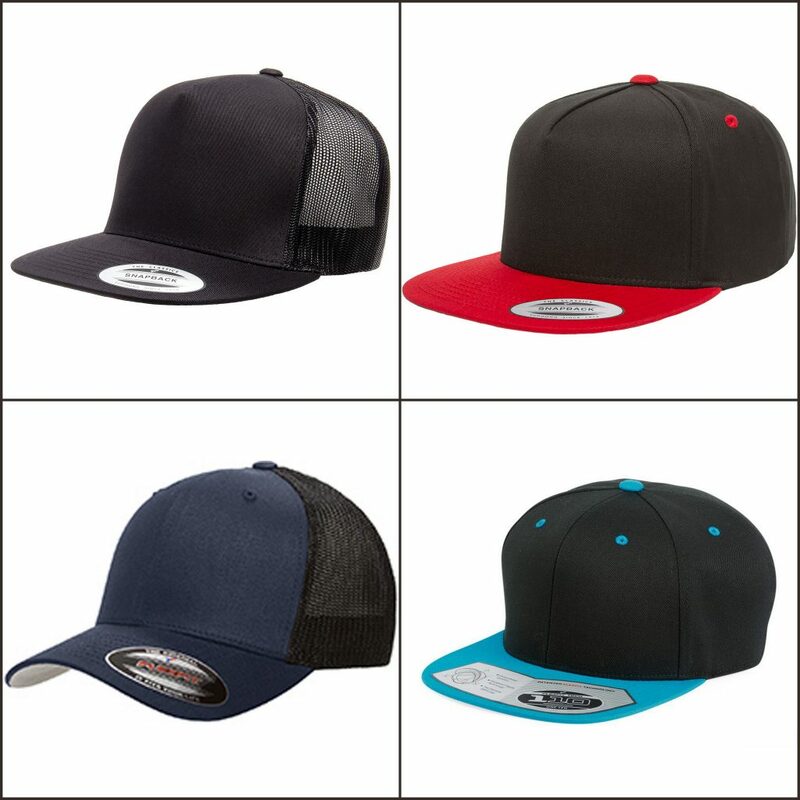 One of the reasons why Flexfit is one of the best blank hat brands is because Flexfit manufacture hats for some of the most reputable brands in the sports, streetwear, action sports, golf and outdoor markets, while also offering a wide selection of the best wholesale blank caps. What makes them stand-out from the rest is their original Flexfit technology. The Flexfit technology is the ultimate fusion of tech and performance. It defies the conventional mechanics of fitted caps by weaving polyurethane spandex into the sweatband and throughout the crown for added elasticity. It is the world’s first patented stretch-fit cap technology used to produce the Flexfit caps, renowned for its universal fit and definitive comfort. This all-purpose hat delivers the perfect blend of comfort and style for sports and casual wear. As one of the best blank hat brands at NYFifth.com, Flexfit offers a variety of premium blank hats, such as Yupoong Classics, Flexfit Delta, Flexfit 110, and more. Yupoong represents Flexfit’s classic hat line anywhere from timeless snapbacks to high quality knits. Crafted with the best materials and perfected over 40+ years, this collection offers authenticity with traditional-yet-stylish looks not available anywhere else. One of our best sellers is the Yupoong trucker hats and the Yupoong classic snapback with a flat bill, which you can view below. For something more lighter, sleeker, and smarter, look to Flexfit Delta! Flexfit Delta is their most innovative cap up to date. It features seamless construction, a multifunctional 3-layer sweatband for moisture wicking, and stain-block technology for a sweat and stain free cap. It also incorporates Flexfit technology for added comfort. These blank caps are perfect for those looking for performance hats for their teams. Yupoong 5-Panel Classic Trucker Cap — Yupoong 6006 and Yupoong 6006W are made with 47% cotton, 28% nylon and 25% polyester, and are structured with high-profile design with a snapback closure. Available in 20+ colors to make sure you can choose a color to match your brand or logo design. Yupoong 5-Panel Flat Bill Cap — Made with 100% cotton twill, this structured high-profile Yupoong snapback also has a green undervisor and is made to bring you breathable condition while out and about. There are 10 colors for you to choose from. Flexfit Trucker Hat — Constructed with 55% polyester, 43% cotton, 2% spandex, this Flexfit cap for embroidery is sure to help you hit the road comfortably. This cap is structured, mid-profile and has a Permacurv visor with silver undervisor. There are 15+ colors for you to choose from. Flexfit 110 Flat Bill Snapback Cap — One of the popular styles of Flexfit 110, this blank snapback hat is a hybrid of the classic snapback and Flexfit technology providing a superbly comfortable fit. There are 12 colors for you to choose from. Last, but certainly not least, of the best blank hat brands is Richardson Caps! Richardson is recognized as one of the leaders in the sports product industry, delivering performance-inspired headwear to millions of athletes around the world since 1970. When Richardson first started, their main focus was to create some of the best headwear and apparel for baseball. In making the best caps for on-field play, Richardson Caps learned how to apply their shapes, fits, and features to performance outdoor and lifestyle headwear designed to be worn everywhere and anywhere. Richardson Snapback Trucker Cap — Combine with 65/35 polyester/cotton front and 100% polyester mesh back, this Richardson 112 is structured, mid-profile and a 6-panel cap. This trucker cap has a pre-curved contrast stitched visor to add the pop of color. The underbill of this cap matches the color of the visor. What makes this trucker cap one of the best: it’s available in 70+ colors! Richardson Patterned Snapback Trucker Cap — Looking for a cap with a fun and trendy pattern? Look no further than the Richardson trucker cap with pattern! Available in 35+ fun patterns and colors, these stylish trucker hats are perfect for outdoor activities. Patterns include: camo, digital camo, plaid, island print and more. Richardson Camo Washed Trucker Cap — Made with Cotton/Nylon or Polyester or Cotton/Polyester, this camo washed cap is sure to keep you cool and protect you from the sun while going on adventure. This camo trucker cap offers a wide variety of camo prints such as the popular Realtree Edge and Kryptek camo prints. Richardson Garment Washed Trucker Cap — The Richardson 111 is combine with 100% cotton front and 100% nylon mesh back. It’s also unstructured, low-profile, and a 6-panel cap with a pre-curved contrast-stitched visor. The garment wash on this trucker cap is the perfect blend of softness, comfort and breathability. There are more than ten colors for you to choose from. For over 40 years, Outdoor Cap has established themselves as one of the largest headwear suppliers. 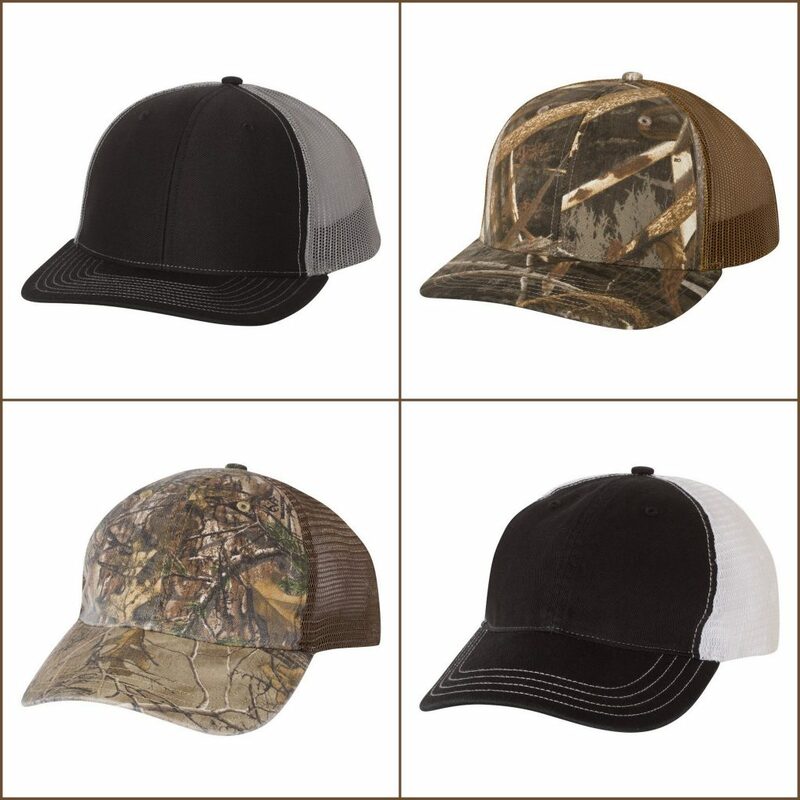 Outdoor Cap is known for their camo caps, which are perfect companions for outdoor activities. Expand your everyday styles with our Outdoor Cap custom blank hats for embroidery. These 3 brands are not only the best blank hats brands, but also great custom blank hats brands for embroidery! Add your brand or logo to any of these blank caps with our imprinting services at NYFifth! We strive for customer satisfaction, as well as offer bulk discounts and fast turn around. For a free price proposal and mock-up, talk to a friendly customer representative today at (877) 695-9722 or email us your inquiry at support@nyfifth-inc.com.